Question: Buying markers for a gift. Thinking of getting Krink markers for a black book. which krink markers would you recommend? and which markers are good for black books? AP Reply: For black book work you need two types of markers. An alcohol based ink marker like the Comix or Molotow basic for filling and blending, and quality paint pens for smooth opaque lines. None of the Krink markers are really well suited for Black books. 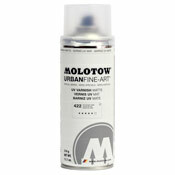 The closest would be the K42 paint pen, but if you are planning to spend that kind of Money then you might as well go for the Molotow High Solid 227s. They are a paint pen that is better in every way. They have a patented valve that allows for more even paint distribution to the nib. Its an extremely smooth flowing and opaque paint formula. There is no better Paint marker for art and design.